ULTRA-BRIGHT COLORFUL LED WHEEL LIGHTS and BE SAFE: Help to make your riding visible from all directions in low light conditions. Each light string contains 20 LED lights which can switch in 7 colors, no hassle to choose all colors at once. There are 3 MODES AND 8 KINDS CHANGES. Steady lighting on Red, Blue, Green, Purple, Yellow, Indigo, White,or flashing within 7 colors. Back to School Sale! BE COOL! EXCELLENT WATERPROOF(IP67 RATED) and DURABLE TO LONG-LASTING: Adopted qualified waterproof soft tube to protect LEDs, unlike others exposed lights(easy to short circuit). So you can keep the LED bike wheel and frame lights on in any weather including rainy days. 7 FEET SPOKE LIGHT STRING FITS DIAMETER 12"-29" (30CM-74CM)WHEELS. Maximum hub diameter 2.2"(5.5cm). 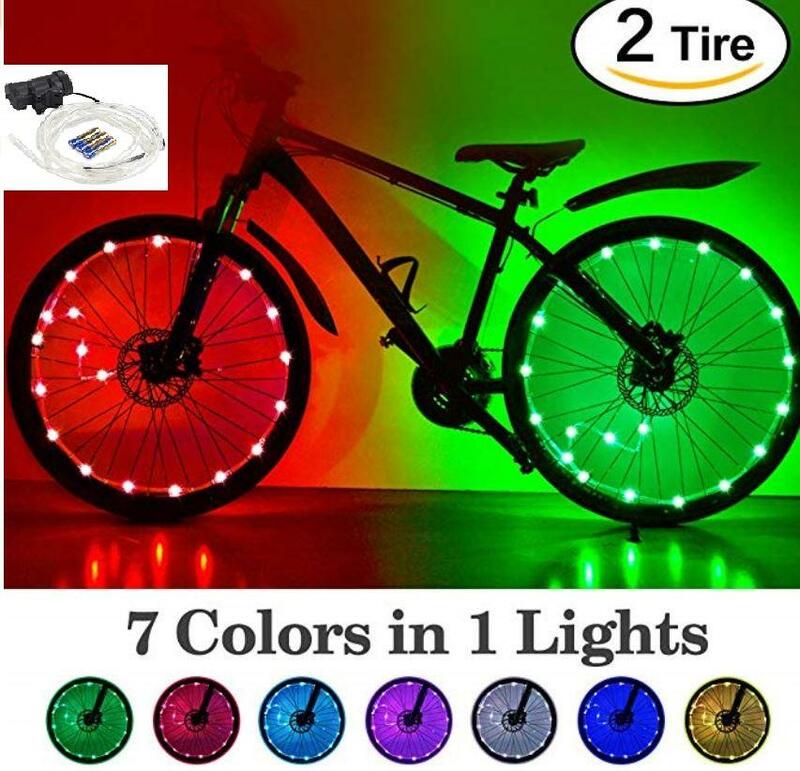 Our bike wheel multicolor lights fit for toddles bike, fixed gear track bike, road bicycle, electric bicycle, wheelchair etc. Every rider deserves an awesome and safe journey by fixing bright led bike spoke lights. 5 MINUTES TO INSTALL EASILY. Here are the steps: Put the batteries into the box; Secure to the wheel hub, twist cable around, trim excess zip tie, leaves wheel free to spin and break, done! NO TOOLS REQUIRED! You can find detailed images descriptions at Product Description, stick to reading this page. PACKAGE: Two string lights for two wheels(with 6 x AA batteries included!). Several nylon zip ties, well packaged in a paper box. Perfect Christmas gift and birthday present for all kids boys, girls, adults.